Beta USA Signs Jesse Groemm! 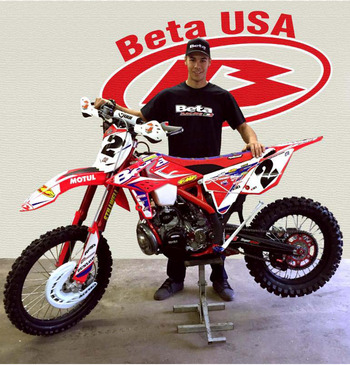 In an effort to further strengthen Beta's offroad program, Beta USA is pleased to announce the signing of Jesse Groemm for 2015 and 2016. Groemm, a New Jersey native, will compete in the GNCCs on a Factory Beta 250 RR in the XC2 class and in the National Enduros on a Factory Beta 300 RR. Groemm, who finished second overall in the 2014 Kenda AMA National Enduro Series, looks forward to his latest signing. "The past three years racing National Enduros, I've learned a ton about racing at a professional level and I've learned some valuable life lessons. My goals have been to win a championship and earn a Factory Ride. I'm excited to say I'm riding for Factory Beta in 2015 and 2016; I'm thankful for this great opportunity and I can't wait to put a Beta on the podium!" Over the course of the 2014 enduro season, Groemm landed on the podium three times and won the Rattlesnake National Enduro in Pennsylvania. Tim Pilg, Beta USA Marketing Manager, commented: "Jesse is a fantastic addition to our team. He finished second last season in the National Enduro series and I feel with his talent, we will have a shot at a couple titles next season. Our Enduro/GNCC team is complete with Cory Buttrick and Justin Sode as Jesse's teammates and I am really excited to see what next year brings." Groemm will debut his Factory Beta at the first National Enduro of 2015 on February 1st.